The simplest way to drastically alter your baked goods for the better is to stop making American buttercream frosting. Believe me when I tell you that this fairly easy step is pretty much the best kept baking secret. Once you start topping your cakes and cupcakes with a different type of frosting, people will tell you that they are just so good and...wait for it...they just can't put their finger on what's different? And then you will all but yell (because you're now just as excited and passionate about this topic as me) it's the FROSTING! 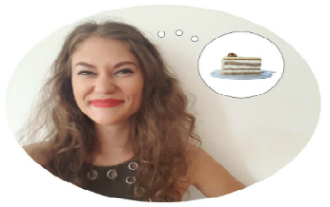 Next you will launch into a lengthly explanation about the differences between different types of frostings and how they are made while overusing phrases like "subtly sweet" and "much more depth of flavor". So, here's the deal. 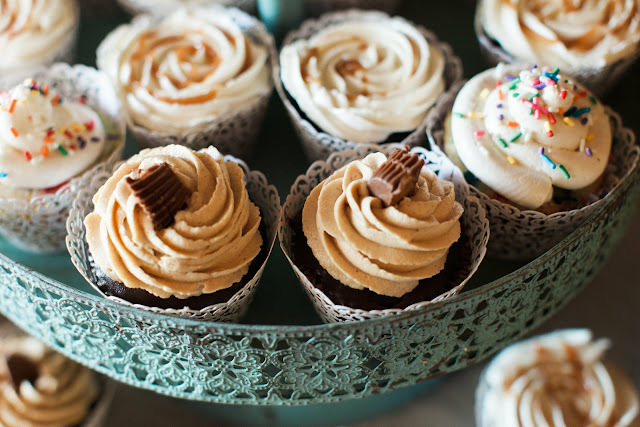 There are five main types of buttercream frosting - nationalities, if you will. French, Italian, German, Swiss, and American. 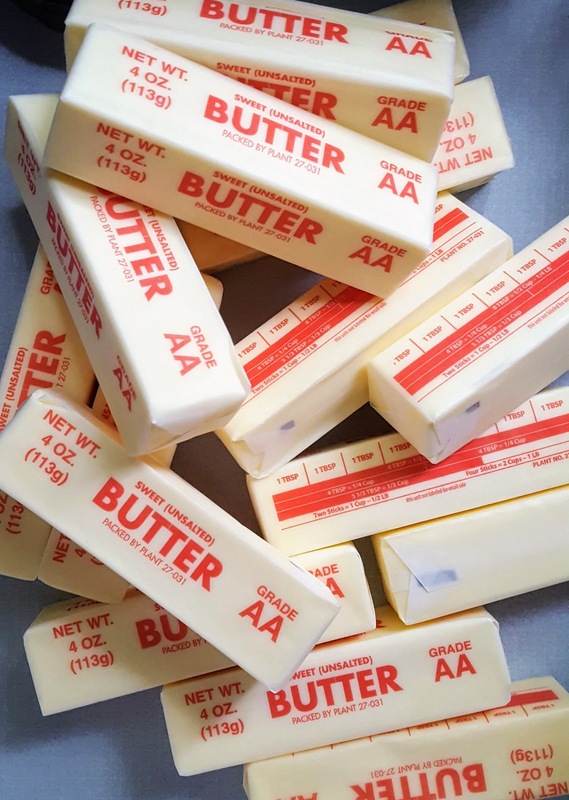 American buttercream is by far the most prevalent in the United States and woefully so - it is also by far the worst tasting. It is sickeningly sweet and tastes like cardboard... in my personal opinion. French, Italian, Swiss, and German buttercream all take a few more steps but are ever so worth it in the end. 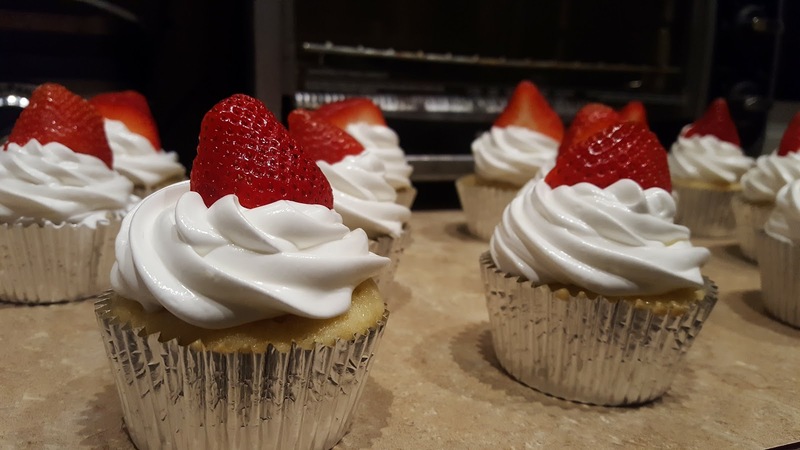 I'm going to explain each type of buttercream and how to make it and then leave you with a recipe for my favorite of the five. these cupcakes brought to you by... buttercream frosting! We'll start with American buttercream (ABC) so that we can get it over with. If you've ever made frosting, you've probably made ABC. This is pretty much the standard frosting recipe - you beat a stick of butter half to death and then slowly add powdered sugar. At the end you'll throw in a touch of salt, milk or cream, and flavorings like vanilla or perhaps melted chocolate, raspberry puree or peanut butter. And there you have it - good ol' American buttercream. If American buttercream is your all-time favorite frosting, I don't want my open disgust towards it to hurt your feelings. So many people were raised on the taste of this overly sweet frosting that it's all but impossible not to have a nostalgic fondness for it. All I'm asking is that you give these other buttercreams a chance. And I do have one ABC caveat. The recipe I use most frequently for peanut butter flavored frosting is actually American buttercream. I make this particular recipe because A) it calls for a lower proportion of powdered sugar than most ABCs, and B) I find that the peanut butter masks the cardboard-y taste of powdered sugar more thoroughly than other flavorings. So even though I bash ABC every chance I get, I still make the stuff on occasion. Basically, I'm a frosting hypocrite. There are worse things to be hypocritical about, right? 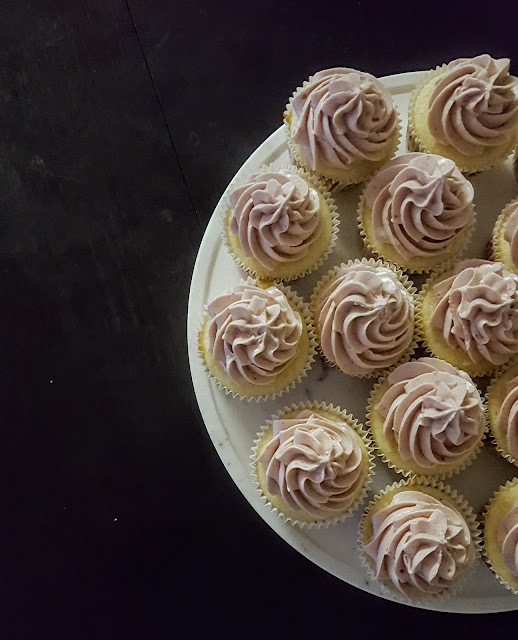 peanut butter cupcakes frosted with ABC, everything else frosted with Italian buttercream. Now that we've got ABC out of the way, let's move on to the good stuff. First, I want to talk about German buttercream (GBC). In my opinion, GBC is one of the most underutilized frostings. To be fair, it's pretty impossible to make a pure white GBC. For this reason and also because it does not hold up super well in heat, it's often used as a filling rather than to frost and decorate the outside of a cake. However, GBC has a great flavor because of its components - butter (naturally) and pastry cream (or crème mousseline, if you want to get technical). The pastry cream is also the reason that GBC will have a slight yellow-ish tint. As I discussed in my previous post on eggs, egg yolks are often used as the base of sauces and curds, and we can add pastry cream to the list. To make a German buttercream, you'll first make the base by cooking together egg yolks, milk, sugar, cornstarch and salt until thickened. This is another one of those plan ahead recipes- the pastry cream then needs to chill in the refrigerator until completely chilled, probably about two hours. Once your pastry cream has chilled, you actually want to bring it back to room temperature again. Why? Well, the reason it was chilled in the fridge was so that it could thicken to its fullest thickening potential. Now that's it's the exact right consistency, you want to bring it back to room temp and you also want your butter to be room temperature. The two will mix together much more easily and thoroughly if they are both close to the same temperature (this is true for many recipes beyond just GBC). The other three buttercreams I mentioned earlier are French, Italian, and Swiss. I wanted to discuss these one after another because the recipes bear quite a few similarities. Each of these recipes uses either egg whites or yolks as a base. These are heated in some way and sugar is added in the heating process. The egg/sugar mixture is then whipped until cool and light and cubed butter is added piece by piece. Finally, flavorings are mixed in and the frosting is ready. However, despite the similar techniques, each frosting has its own distinct taste and applications. French buttercream (FBC) is made by drizzling a hot sugar syrup into beaten egg yolks, whipping that up, and adding butter, vanilla, etc. As you might guess, FBC has a very rich flavor. Because of its high fat content, like GBC, it does not hold up super well in warm temperatures. Neither of these would be my first choice for frosting a wedding cake. However, FBC is delicious and totally worth making. It has a unique bright yellow color due to the egg yolk base AND it has a flavor not quite like any frosting you have ever tasted before. It makes an excellent filling for macarons but could also be played against something very light or simple like a plain-jane vanilla cupcake to contrast and spotlight FBC's deep, rich flavor. Italian and Swiss are actually meringues, as in, Italian MERINGUE buttercream (IMB) and Swiss MERINGUE buttercream (SMB). These two bear the most similarity to each other of all of the frostings in this post. They are both composed of egg whites, sugar, water, salt, butter, and vanilla. They are the most stable of the buttercreams (due to a lower fat content) and thus hold up the best in heat. These are my go-to frostings for wedding cakes or any cake/cupcake that may be spending some time out in the summertime. They also taste extremely delicious, so that's another plus. IMB is made by boiling sugar and water together until it reaches soft ball stage, so about 235 degrees Fahrenheit. This syrup is then immediately pulled off the stove and slowly drizzled into beaten-until-frothy egg whites while running the mixer at a low speed (exactly the same as FBC, except you're drizzling syrup into egg whites instead of yolks). 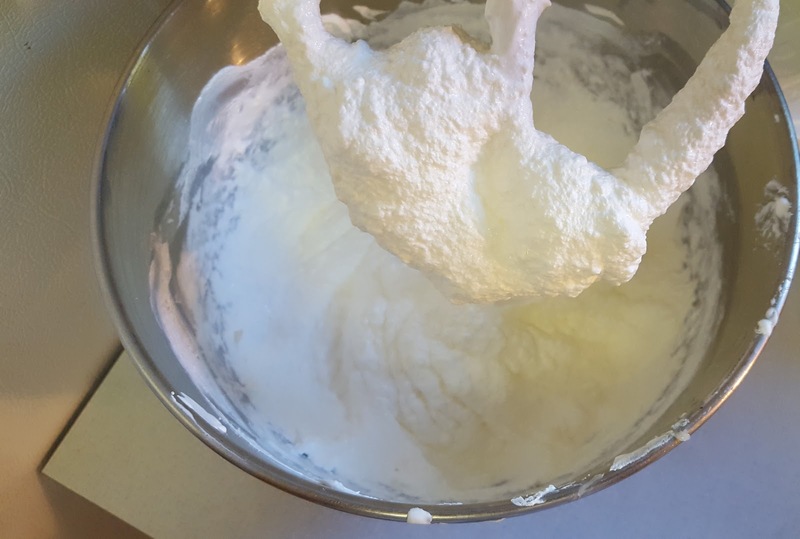 Once all the sugar syrup has been incorporated, you will increase the speed of the mixer to high and whip it up into a meringue. You want to continue whipping until the bowl is cool to the touch. At this point the butter is added, cube by cube, and then the salt and vanilla. Finally you just need to whip it a few more minutes until it is smooth and silky. Mmm. I think silky is such a delicious (and accurate!) way to describe buttercream. It's a very tasty word. As a side note, all of these recipes are completely doable with a hand mixer. I know this for a fact because I've made them many, many times with my trusty $20 hand mixer. Of course, it's much less laborious with a stand mixer, but please don't let lack of a Kitchenaid stand in the way of your own personal buttercream frosting paradise! I've saved Swiss meringue buttercream for last because it is my absolute favorite. It's so versatile and I personally find it much less harrowing to make than IMB (no scary syrup drizzling!) with very similar results. The process of making SMB is only slightly different from that of IMB. Instead of making a sugar syrup, you mix the egg whites with the sugar and then slowly warm them in a double boiler. I usually mix them in my Kitchenaid bowl and then just put that over simmering water in the tiniest pot I own. It's important to stir or whisk the egg white and sugar mixture pretty constantly while heating it to make sure you don't get any egg-scrambling action going on. my double boiler setup. also a little embarrassed by how well you can see my reflection in the bowl. When the mixture reaches 140 degrees or so, you can take it off the double boiler and immediately start running the whisk attachment on your mixture at a low-ish speed (around 2 or 3) for a minute or so and then increase it to high. You will whisk this mixture until it turns into a beautiful fluffy white creation and even then continue to whisk until the bowl is cool to the touch. Sometimes I get impatient at this point and begin to contemplate what the definition of "cool to the touch" really is. If you also start feeling impatiently philosophical during this step, here's my conclusion (after much soul searching): it doesn't have to be cold per say, but cool enough that it won't melt the butter you are about to start adding. If you've never made a meringue-based frosting before, I would recommend grabbing a spoon and dipping it in for a taste at this point. The egg whites were pasteurized when you heated them up in the double boiler, so don't worry about raw eggs, and... it's DELICIOUS! Sometimes I skip adding the butter and just pipe the meringue onto cupcakes (super sticky and messy but worth it). If you've ever made seven minute frosting, that's basically what we have right here with the meringue. If you feel like going rogue, meringues can be used for any number of things - you could glob the stuff onto a pan, bake at low heat for a few hours, and end up with some crunchy, light, airy goodness. You could also top a lemon meringue pie with it. Really, you could do any number of things with it, including but not limited to eating it straight from the bowl. But, I digress. Since we're talking Swiss meringue buttercream, we will do none of the above. Instead, swap out your whisk for the paddle attachment and mix at a low speed as you begin to slowly add the cubes of butter. Once all the butter has been integrated, add in vanilla and salt and continue to beat at a low-medium speed until it comes together and has a soft, silky texture. Then give it a taste, and, YUM. Something that often trips up people as they make the meringue buttercreams is the perceived curdling. As you add in the butter, cube by cube, the mixture will often begin to look like thick curdled milk or small curd cottage cheese. Gross, right? Believe it or not...that's actually my favorite part of making buttercream. To me, it's the sign that the buttercream is almost ready. Usually when I see 'curdling' it comes together beautifully within a minute or so. I feel so victorious when something that looks gross and curdled becomes deliciously smooth a minute later. If I can make that happen, I can do anything, right? 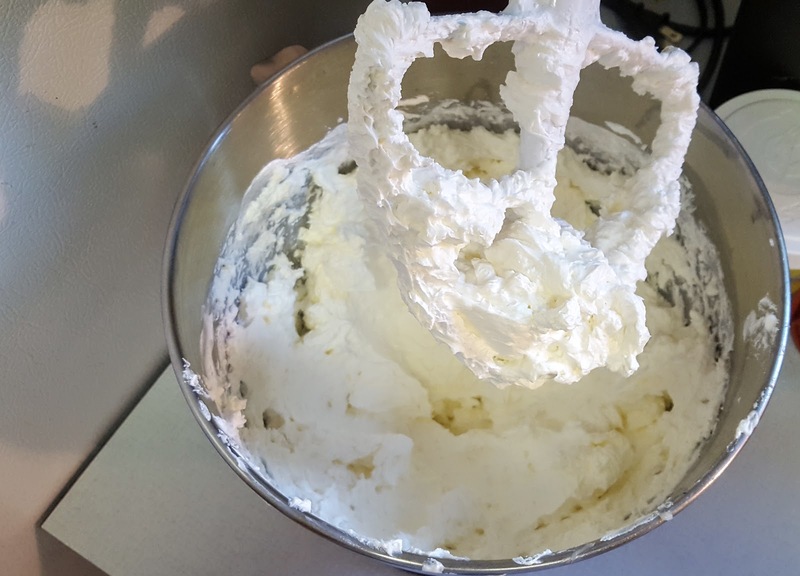 So if you see your buttercream taking on a curdled appearance, PLEASE do not toss it. Instead, high five yourself. You are so close! the curdled look - don't get discouraged! If the butter you are adding is too soft, your mixture may get a little soupy. This is not one of those recipes where you want almost-melting-softened butter. I usually don't even take the butter out of the fridge until right before I start heating up the egg whites and sugar on the double boiler. So that right there makes this recipe even easier - you don't even need to plan ahead and take out butter to soften! However, if you do get soupy buttercream, don't worry. Just stick the whole bowl in the fridge (covered) for 15 minutes or so and then it should whip right up. If you have the opposite problem - your mixture is too cold and the butter is not integrating cohesively - here's a nifty tip: grab a washcloth and wet it with hot water. Wrap the warm washcloth around the bowl. When it gets cool, wet it again with hot water and and repeat. This will gently warm the butter and your frosting should come together quite smoothly. American buttercream usually forms a crust after being piped onto a cupcake or cake, which will make it much easier to transport without messing up your decorations. The rest of these frostings do you one better - if kept in the fridge for an hour or two, the frostings completely harden. This is ideal for transporting. To get the frosting back to that creamy smoothness, just let the cake or cupcakes sit out for an hour or so before eating, or until the frosting is soft to the touch. If you're not going to use any of these buttercream right away, I highly recommend using the saran-wrapped-logs-of-frosting storing technique that I talk about in my post on baking 300 cupcakes, under the section titled "Lesson #3 - Planning Ahead. "All of these frostings will keep well in the fridge for 3 to 4 days and also freeze beautifully. I've heard you shouldn't keep them frozen for longer than a month, though I've never tested this theory out. I like to make a big batch of buttercream and then just freeze whatever I don't use and that way I get a jump on my next baking project. Making ahead is very helpful if you're baking for a large number of people. To thaw, just move the frosting from the freezer to the fridge a day or so before you want to use it. To warm up fridge-cold frosting, you can do one of two things. 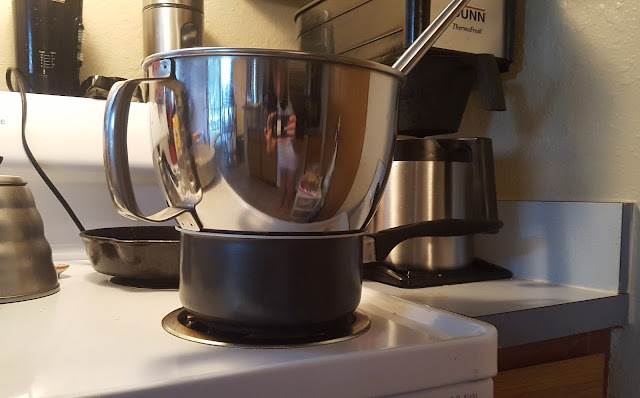 The first is to heat it over a double boiler, stirring constantly, until it is partially melted and looks curdled, and then whip on low speed until smooth. The other option, which I call Joanna's Lazy Method, is to pull it out of the fridge a couple hours before you need to use it and then try whipping it up. If it's too cold, use the warm washcloth method I mentioned earlier. This second option is probably slower but I just hate using extra dishes that I'll have to wash later and in my mind, setting up a double boiler seems like a lot of extra work (it's not). 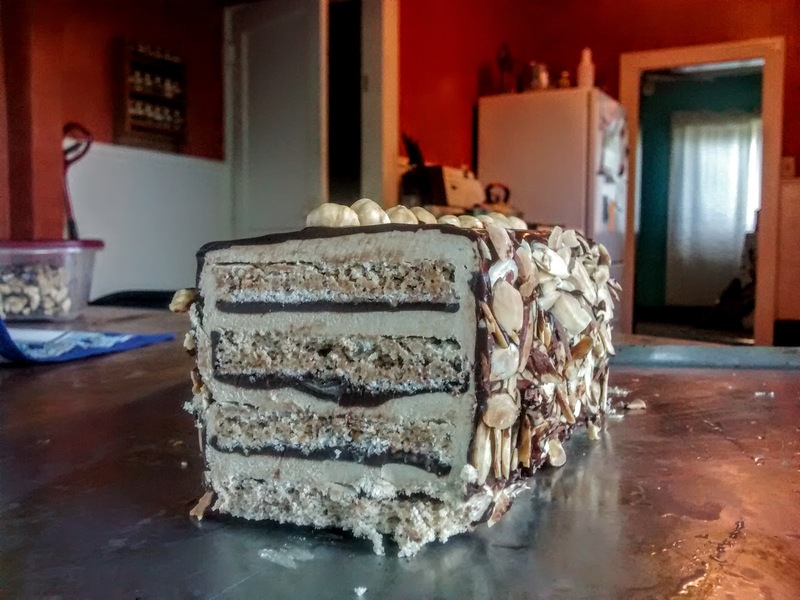 I think I've covered most of the main issues I've encountered while making buttercream. If you have any difficulty, give me a shout and I'll see if I have a solution. And now, with no further ado, a recipe for Swiss Meringue Buttercream. 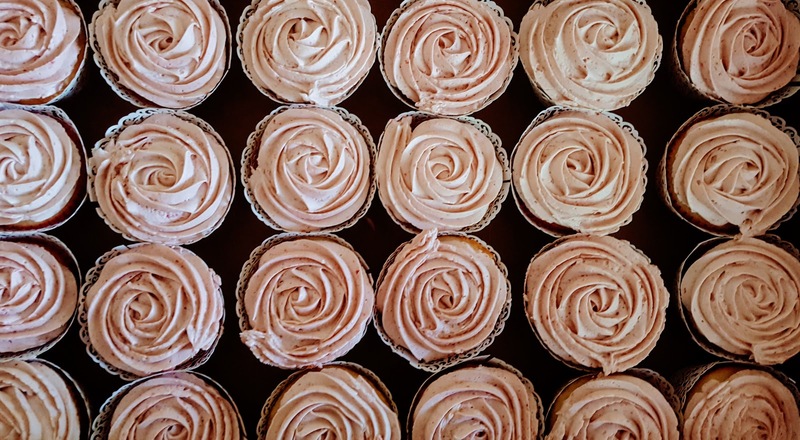 Please, please, please give this delectable frosting a try! 1. Put egg whites and sugar in a very clean bowl (I use my Kitchenaid bowl). 2. Create a double boiler by simmering a small amount of water in a small pot and putting your bowl of egg whites and sugar over the simmering water. 3. Heat until the temperature of the mixture is 140 degrees F, stirring constantly. If you don't have a kitchen thermometer, heat until all of the sugar has dissolved. You can check this by putting a bit of the mixture on your finger (it's hot!) and seeing if it feels gritty. 4. When the temperature reaches 140 and the sugar has dissolved, remove from heat and immediately begin to whip at a low speed (2 or 3). After a minute or so, increase the speed to high (7 or 8) and whip until light and fluffy and the bowl is cool to the touch (about 10 minutes). 5. Swap out the whisk attachment for the paddle attachment and begin slowly adding cubes of butter while beating at a low speed (2 or 3). Beat well after each addition. 6. Once all of the butter has been added, beat in the vanilla and salt. Continue beating until frosting comes together and is smooth and light. 7. Add in additional flavorings, if desired.